This is a very timely release from Opus Arte because it allows us to catch an American epic on the rise. 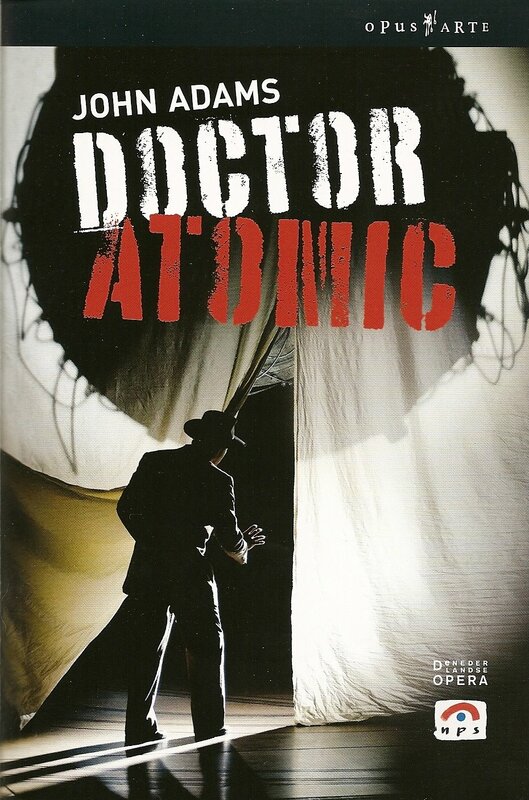 Doctor Atomic was commissioned by the San Francisco Opera and was first staged there in 2005. This performance, a San Francisco/Chicago/Amsterdam co-production, was recorded in June 2007. The debut of Doctor Atomic at New York’s Metropolitan Opera is imminent and an international live cinema relay from that venue has been announced for November 8. There is a tendency to approach contemporary music with caution, if not downright suspicion. Fear not, because this is opera on a grand scale: an intense music drama with cumulative individual and collective emotional impact. John Adams has set a blank-verse (with poetic augmentation) libretto by Peter Sellars. Most of the text was extracted verbatim from primary sources, which entails the presentation of far more information than is customary on the opera stage. It is a tribute to the collaboration of Adams and Sellars that this material emerges with impressive clarity in operatic English. The overture plays to a sequence of black and white newsreel footage displaying the ravages of total war and fully mobilized societies. The first scene introduces frenzied activity at the Los Alamos, New Mexico, setting of the Manhattan Project (the codeword for the development of the atomic bomb). It features turba-like choral delivery with dancers in support. The principals exchange lengthy pronouncements in the manner of sprechgesang, conveying their concerns about moral issues, the practical application of new science and the terrifying risks at hand on the eve of the first actual test of the weapon. The libretto is a serious challenge, which could not possibly work without the composer’s valiant-for-truth, rhythmically vital music. This first scene is a 27-minute barrage of tension, which dissolves in the harmony of the second. Away from the crowd, in the Oppenheimer bed chamber, the chief scientist and his wife find consolation in a sequence of achingly beautiful and loving songs. The pattern is maintained through both acts with scenes of buzzing ensembles alternating with intimacy and introspection. Doctor Atomic further demonstrates the pre-eminence of Gerald Finley in the baritone opera repertory. His range and articulation are truly inspiring. Jessica Rivera is equally impressive as Kitty Oppenheimer. The remainder of the cast is fully committed with not a single weak link. Peter Sellars achieves period authenticity to a remarkable degree and in line with his determination to present the unvarnished facts of the situation. No embellishment is required to reenact a supreme drama, which continues to influence all of our lives. Adams and Sellars render great art at the service of humanity.